casting and angling skills before you head to the tropics. I’ve watched even experienced trout anglers become frustrated, angry, and even embarrassed on bonefishing trips because they weren’t ready for the wind, difficult fish spotting, and unfamiliar directions given by a guide. Just a little preparation will make your first trip a lot more fun. And since most people travel a long way and spend a week’s pay or more for a bonefishing trip, the investment of time and energy in a little pre-trip training is certainly worth it. 1.Practice your casting. Most bonefish are caught within 40 feet, but that 40-foot cast must be made quickly, under pressure, with deadly accuracy, and often in the face of a stiff breeze. Being able to get 40 feet of fly line outside the rod tip is not enough. Pace out 40 feet and make sure you can hit a target the size of a hula hoop with reasonable consistency, with a wind coming from any direction, and be able to change directions to cast to another hula hoop with just one false cast. Bonefish are spooky critters, and too many false casts will ruin your chances. 2. Get a sense for how fast your flies sink. Either before your trip or just after you arrive, take three bonefish flies—a heavily weighted (also called “deep”) version, lightly weighted (shallow) version, and unweighted (tailing) version—to some shallow water where you can see the fly sink. Watch how fast each fly lands, as having different sink rates in bonefish flies is far more important that having the favorite fly on the island. Over sand and mud bottoms, you want the fly to sink to the bottom and make little puffs of silt when you strip, because these plumes attract the attention of a bonefish looking for a crab or shrimp trying to escape. Over weedy and coral-covered bottoms, a bonefish can’t see a fly that sinks down into the debris (and you’ll get hung up), so you’ll begin to strip your fly before it hits bottom. And you never know beforehand how deep the water will be on a given flat, so you must have some idea of how fast your fly will sink—and be prepared with flies with different sink rates. 3. Be prepared to have trouble seeing fish and to have to learn on the water. 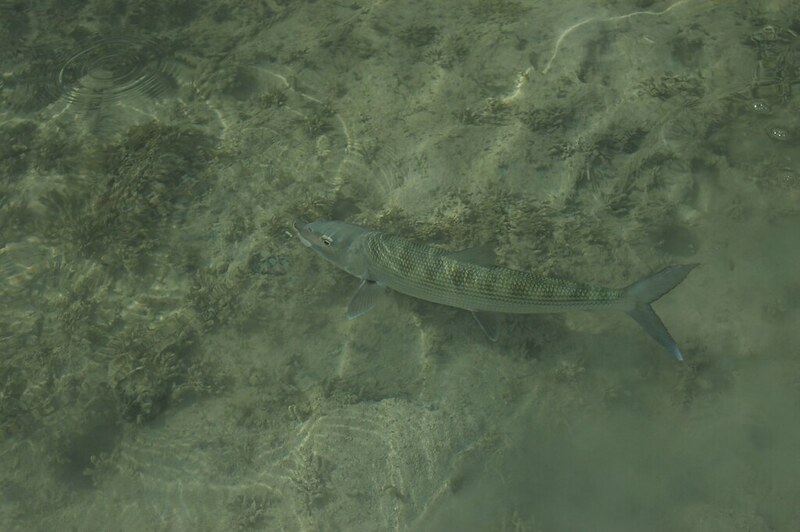 No matter how good you are at spotting trout or steelhead, you will have trouble seeing bonefish in the water, at least for the first day and probably for a couple of days. Count on it. Bonefish are nearly invisible underwater because their shiny sides reflect the bottom, and without a shadow to pinpoint their position you’ll have a very difficult time. If you are unlucky enough to have a week of cloudy weather, you may see very few fish unless they are tailing in shallow water. Some guides are excellent at helping clients learn to spot bonefish, while others, because of a language problem or reticence, just tell their anglers where to cast and forget about trying to teach them. Try to discipline yourself to look through the water, not at it, and remember that bonefish hardly ever stop moving, so look for shadows and grayish indistinct shapes that don’t stay put. don’t be frustrated if you have problems early in your trip. 4. Learn to follow directions. Once you get onto a boat with a guide, remember that he will be giving you directions to cast by the hands of a clock in relation to the boat. Twelve o’clock is always directly in front of the boat, not where you are looking. And you will get befuddled—guaranteed. I don’t know how many times I’ve had a guide say, “Cast thirty feet at 9 o’clock. . .[Sigh]. . . No. The other 9 o’clock.” I even saw an enterprising young Bahamian guide on my last trip who had painted the hands of the clock, including the numbers, on the bow of the boat, just for clods like me. The other miscommunication with guides and clients involves distance. Different people have different ideas of what 40 feet is, especially in the heat of the moment. Make a short and a long cast before you start and ask your guide how far the casts were. If you’re traveling to Mexico or Central America, it’s not a bad idea to learn the words for 20, 30, 40, 50, and 60 feet before you leave.